I have a passion for reworking old technologies and incorporating modern tech to create curious new hybrid forms. It has given me great great pleasure in recent years, to build and restore bikes and my search for parts and information lead me to the fantastic "RetroBike" forum. I wanted to attend a local event and chose the annual Beach Cruise, which apparently is growing with each year. I loaded my bike onto a car rack sourced through the forum and drove down to the beach front at Hove ready for the 11am start time. We had to wait a while for "Whatleymeister" who had opted to ride the 48 miles from his home in Guildford, top marks you nutter! Setting off, we enjoyed a pleasant cruise along the seafront to Brighton and following the undercliff path to Rottingdean via Brighton Marina. The forecasted showers missed us, the sun shone for the most part and there was a pleasant tail wind. The return journey involved a jaunty climb followed by a natty cliff top route into a brisk headwind which appeared to increase in force exponentially the closer I got to the start point! There was an amazing selection of boutique bikes in the pack, all in mint condition, Pace, Klein, Kona, Slingshot even! My own steed, a Staco 3 speed town bike, was by far the most humble but as was pointed out to me definately the most retro. It seems that since the return from my last jaunt in April I have done nothing but DIY around the house. So having completed lots of essential DIY chores, I owed myself an escapist treat. I had an easy, but early 7am - 12am session at work, but this, coupled with my 30 mile cycle commute and a late lunch meant an afternoon nap was mandatory. I awoke an hour later feeling decidedly week and shaky; but forced myself to get going and out of the house. My destination was Chatham, once one of the British Empire's major naval bases and next door to Rochester, a favorite city of the popular English writer Charles Dickens. In modern times Chatham has contributed the word "Chav" to common parlance, this would roughly translate to "Punk" for our North American cousins. But Chatham is also home to the longest dry ski slope in Kent. For the cynical doubters, Kent also has dry ski slopes at Bromley, Tonbridge and Folkestone. In the unlikely event that you have never heard of dry ski slopes before, they are artificial materials laid over a hill side, so as to simulate the sensation of sliding on a snowy surface. The Chatham ski centre itself is quite hard to find, even using sat nav and having visited once before, I still managed to drive past. Upon arrival and to my great surprise, the slope was totally empty; I know August is never going to be peak ski practice season, but I thought there would be someone else larking about. Having paid the fee and signed the disclaimer I kitted up and headed out with some trepidation. It suddenly occurred to me that I hadn't skied on this type of surface since the late 90's, I hadn't worn SkiBlades since Tignes in April. Would I have forgotten everything and resort to a few snowplough descents before heading to the pub to drown my sorrows? Luckily the first run went ok, inelegant, but I survived. The surface doesn't glide like the real thing, at the same time it was proving elusive to find the edge "break away" point. I persevered, then suddenly, after an hour or so, I had cracked it and could speed things up and start enjoying myself a whole lot more. As the afternoon became evening others joined me on the slope. A cautious SnowBoarder put in some turns as we met at the lift, it turned out to be a member of staff "Are you still out here?" he enquired. I checked the time, it was nearly 3 hours since I had arrived and I had only paid for a 2 hour session. I put in a last run and headed back to the car before I was dragged off. It was great to be "back in the saddle" if only metaphorically; I had asked previously if SkiBikes could be used at Chatham, but was rejected on the grounds of health and safety. To be honest, the slope is quite small and the possibility of novice SkiBikers crashing doesn't bear thinking about. I went home, had refreshments and slept like a log. I didn't dream about Chatham, Chavs or Charles Dickens, but I did enjoy an afternoon of Great Expectations fulfilled. Should you feel like giving it a try, a 2 hour open practice session cost £16. Boots and skis are included if you need them. You need to be able to ski to a level where you can link turns, control your speed and stop. Group lessons and tuition are available throughout the year if you don't meet these standards. Velogemel... it was a new word to add to my lexicon, I came across it by accident whilst researching Swiss SkiBike manufacturer BullSkate. Some manufacturers might claim to be "The original" skibike, but surely the Velogemel has to be the Grand Daddy of them all, with its wooden design, that goes dates back over 100 years. Here's what the Velogemel web site has to say. In summer Christian Bühlmann used a bicycle. 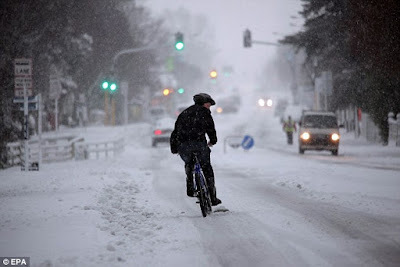 This gave him the idea of transferring the principle of the bicycle to the sledge. In 1911 he therefore built a snow-bicycle in order to get around faster on downhill and flat stretches – the bike-sledge was created. It had a wooden frame with two runners steered at the front by handlebars, the seated position allowed one to push off with the feet and hence move forward in a manner similar to that of the first bicycle by Drais (Draisine). Velogemel - The Original SkiBike? Parts of New Zealand are seeing their first snowfall in 80 years as a "once in a lifetime" polar blast spreads across the country. The capital city of Wellington ground to a halt as services across the country were disrupted by the heavy snow. Mail deliveries were cancelled along with many flights in the region. Main roads have also been closed. People took to the streets to play and take photos of the winter wonderland as for many it was the first time they had seen snow in the area. Wellington, which rarely gets snow, is witnessing its highest levels since the 70s. Further south, Auckland is experiencing its first snowfall for 80 years. Forecasters have described the massive change in weather as a "once in many decades event". The cold snap is predicted to last several days but for now most people seem to be enjoying their time in the snow.